I think it's broken. 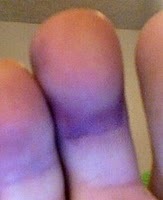 It's black and blue and swollen. I'm going to go the doctor tomorrow. I'd now like to take this time to thank The Writers Guild of America. Without them I would not have health insurance and would not be able to go to the doctor for a broken toe. Or a cut finger. Or a heel spur. Or strep throat. Or the much needed psychiatric help I receive each month. Thank you, Writers Guild, for keeping me healthy and (somewhat) sane. PS - Manic Mom asked me for a picture of the toe, so you can thank her for the image above.